In this activity you create document types for customer, vendor and general ledger business transactions in Financial Accounting. Document types differentiate business transactions and control document filing. You specify a number range for each document type. Document numbers are chosen from this number range. You can use one number range for several document types. One can either chose to follow the document type defined by the SAP or can create its own by selecting the option New Entries. SAP recommends to follow predefined document types for ease of operations. 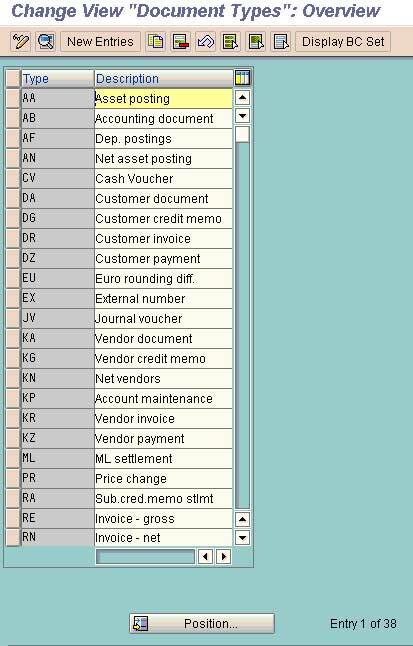 Select this indicator to have the system automatically deduct cash discounts from vendor invoices that are posted with this document type. Posting net is not supported for accounts receivable. Indicator that for documents of this document type no more than one customer or vendor account can be entered. However, more than one line item can be posted to the same customer or vendor. Indicates that individual line items can be marked as negative postings . Once you post a document in Financial Accounting, the system updates the transaction figures. If this indicator is set, you can use this document type to reverse incorrect postings item-by-item by making negative postings and thus eliminate their effect on transaction figures. Set this indicator if the reference number must be a required entry during document entry with this document type. You want to post a vendor invoice using document type KR. The reference number indicator is set in document type KR. An entry is therefore required in the reference number field. When entering this document, you could for example enter the vendor's invoice number in the reference field. If the reference number field is specified, the system will transfer the reference along with the document date to the DME file for the payment run. Set this indicator if document header text must be a required entry during document entry with this document type. IS it TRUE that Document Type is defined at the CLIENT level and available/valid for ALL Company Codes??????????? ?